Vinyl album sales smashed records on both sides of the Atlantic in 2014, as a format that recently seemed on its last legs hit astonishing new heights. Music Business Worldwide‘s analysis of the past decade shows just how miraculous vinyl’s recovery has been. In the UK in 2014, vinyl album sales totalled 1.3m – six times bigger than its tally just five years earlier (2009). 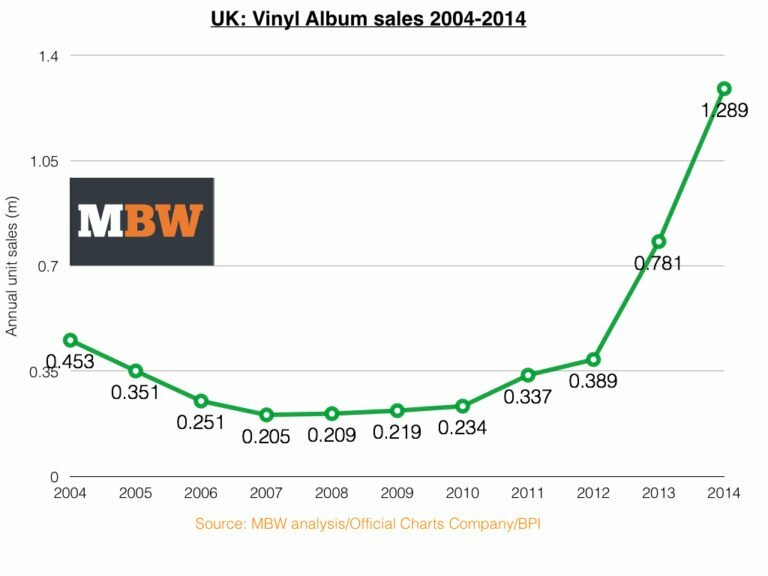 In fact, 2014 provided the most vinyl albums sales in the UK since 1995 – nearly 20 years ago. In the US, vinyl sales have quadrupled in the past five years, narrowly missing out on a 10m sales milestone in 2014. Amazingly, the year’s 9.2m vinyl sales haul is the biggest since Nielsen Soundscan records began in 1993 – by some distance. 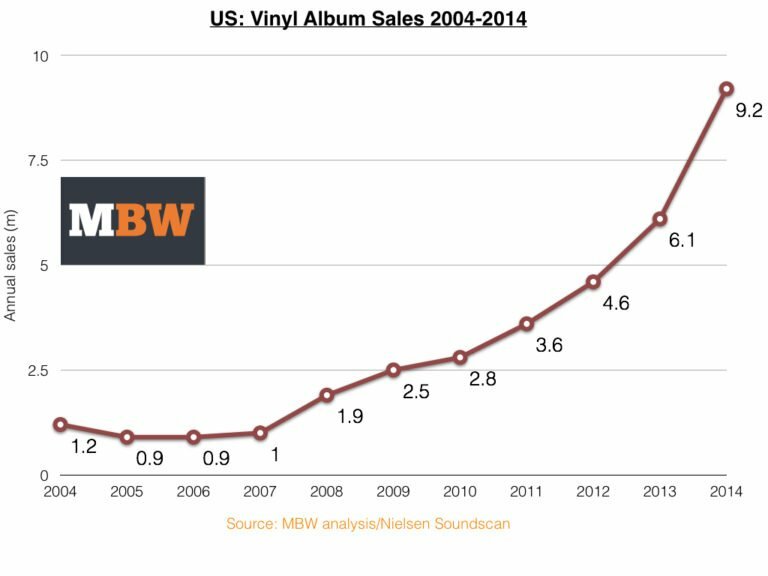 To put the achievement into context, the biggest annual US vinyl sales performance in the 10 years after Nielsen started monitoring the market (1993-2003) stood at 1.5m in the year 2000 – six times smaller than 2014’s tally. Historical Nielsen Soundscan and Official Charts Company/BPI data shows that, in the mid-noughties, vinyl album sales seemed in terminal decline. In the US in 2006, when annual sales hit an 11-year low of 858,000. Over in the UK, it would take another year to hit rock bottom: in 2007, just 205,000 vinyl albums were sold in the year. In both countries, vinyl’s share of the total albums market was less than 1%. Then something very unlikely started to happen – and has continued to happen ever since. The US has experienced strong vinyl growth every year since 2007, when a million 12″ albums were sold for the first time in three years. The UK has seen similar consumer patterns, starting a year in 2008. But the most astonishing moment in the story of vinyl’s rebirth has come in the last two years, when its popularity has exploded to a phenomenal degree. And as you can see on the graph above, in the UK, the last two years have kick-started a huge renaissance for vinyl albums. Annual UK sales were up a whopping 101% in 2013 to 781,000, while 2014 saw a further 65% climb to 1.3m. Vinyl’s market share of all album sales was 3.6% in the US in 2014, while in the UK it claimed 2%. At the current rate of growth, annual vinyl album unit sales could hit 13m in the US next year and break the 2m barrier in the UK – figures which would have seemed little more than a fantasy just a few years ago.